Editor’s note: This is the eleventh in the Beer Advent Calendar 2015 series. Likewise, I’m going to be posting a beer review each day. Some will be Christmas or Winter ales and other selections will be beers I’ve been wanting to review for some time. McTarnahan’s Amber Ale gains its name from one of the first investors to Portland Brewing Company. This beer pours amber/reddish in color, with about two inches of fuzzy head on the top of the glass. 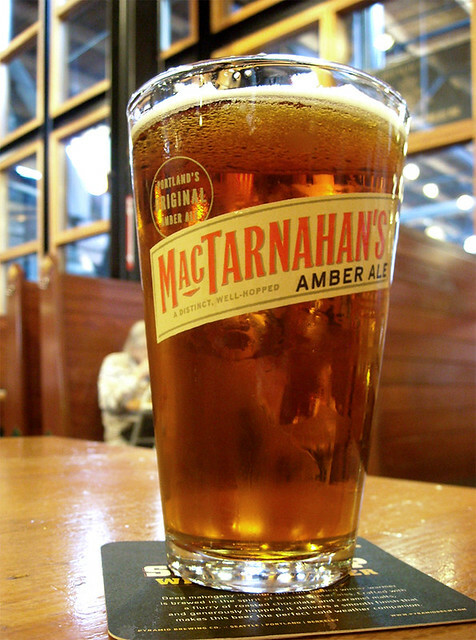 McTarnahan’s Amber smells of lemon zest, grapefruit and other citrus with a hint of toasted nuttiness and toffee. The beer isn’t overtly strong in smell, which foreshadows it’s taste profile. To your tongue, you’ll pick up on the light floral hoppy notes. Portland Brewing says they use Cascade hops in the brewing process and I’m estimating that its not in high quantity because this beer is a little bland overall. Its light body and low ABV would suggest the same. Focusing back on taste again, there are lingering notes of grapefruit, lemon and maybe a bit if pine bitterness. Again, this isn’t a very hoppy/bitter beer – all the tastes and flavors are subdued. Honestly, no. As far as Ambers go, there are so many other options on the market, such as Full Sail Amber (previously reviewed last week).